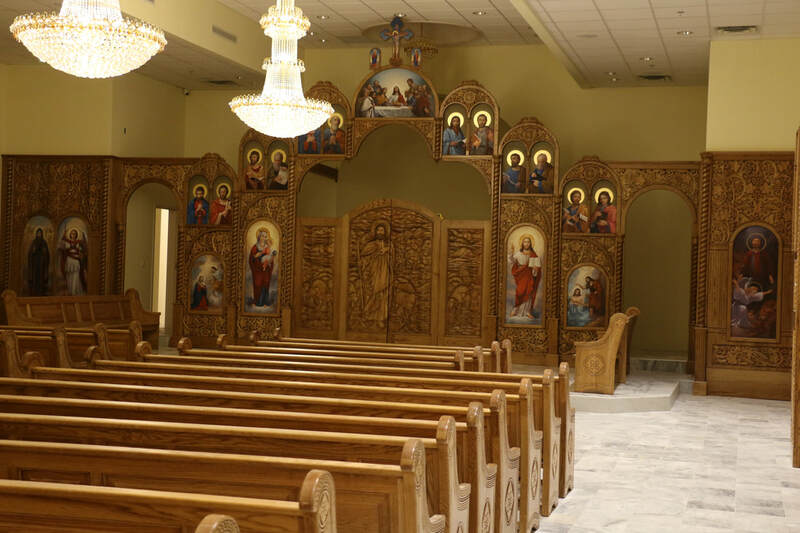 From Wednesday 1/11/2018 thru 1/18/2018, the installation of Archangel Michael and Saint Misael the Anchorite Church's Iconostasis, icons, and the Altar began with the Engineer's help who implemented the wood design in Egypt. On Wednesday 12/27/17 at 6:50 AM, one hour earlier than the scheduled time, the second truck arrived and many Church members gathered to unload the truck. 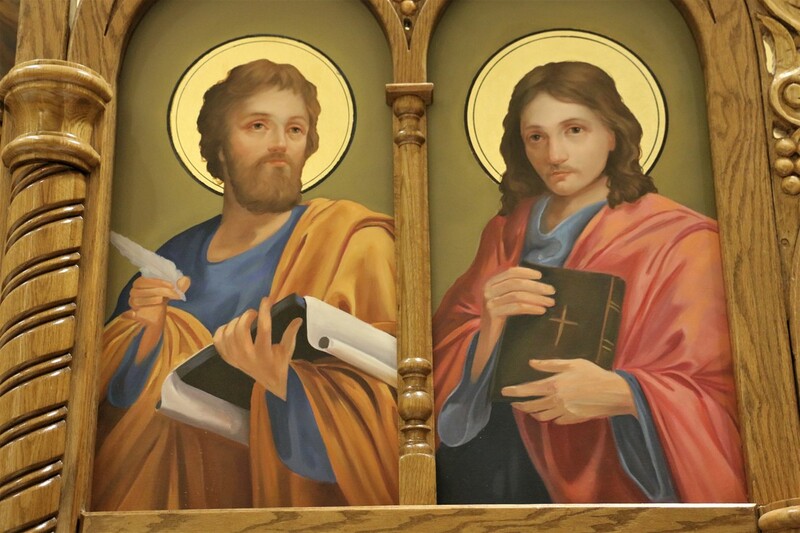 The truck had the Archangel Michael and Saint Misael the Anchorite Church's Iconostasis, icons, the altar, and some other miscellaneous items. Servants' tour and orientation for the new building. 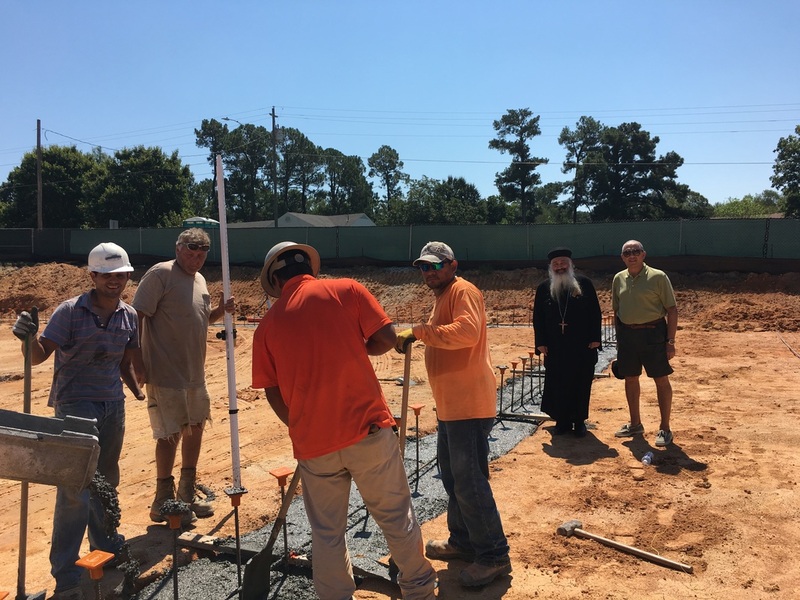 On Sunday 12/24/17, after the liturgy and Sunday School service, the servants had a tour and an orientation of the new building. 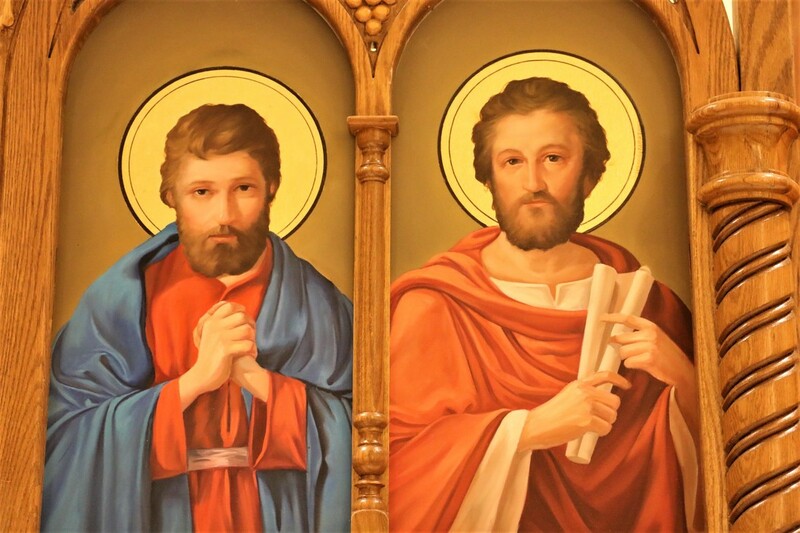 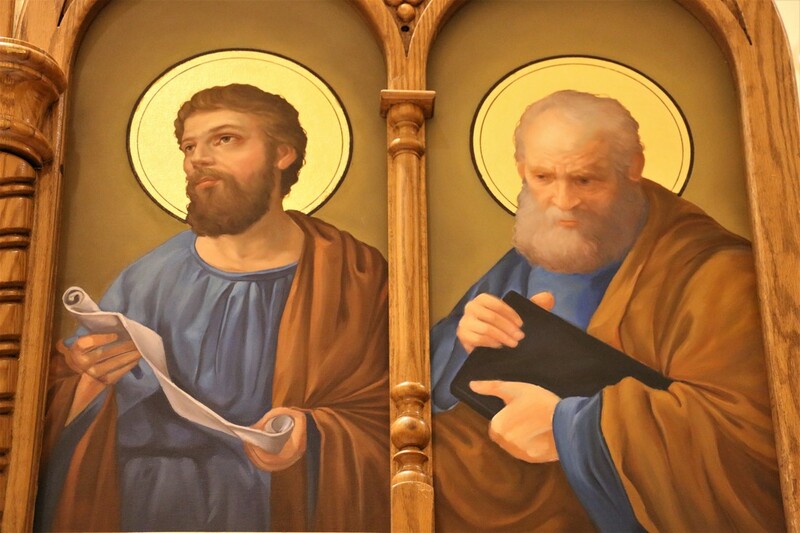 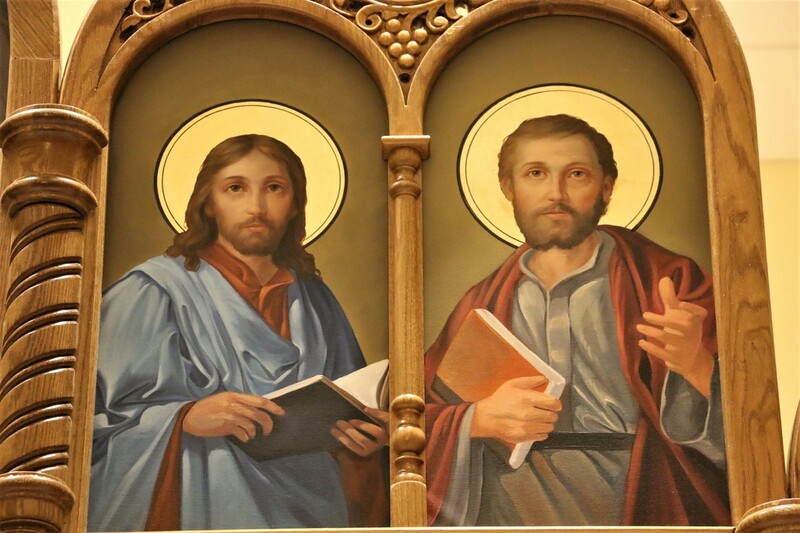 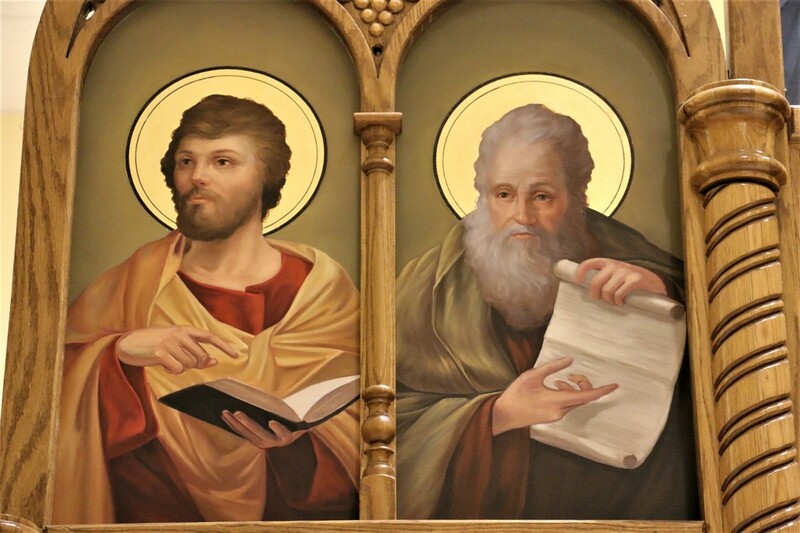 They walked through Sunday School classes, Archangel Michael and Saint Misael the Anchorite Church, the basketball court, the kitchen, Bethlehem room, and the dining area. 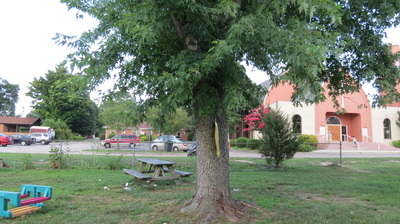 It was mentioned, as part of the basketball court rules, there are no high heels were allowed. 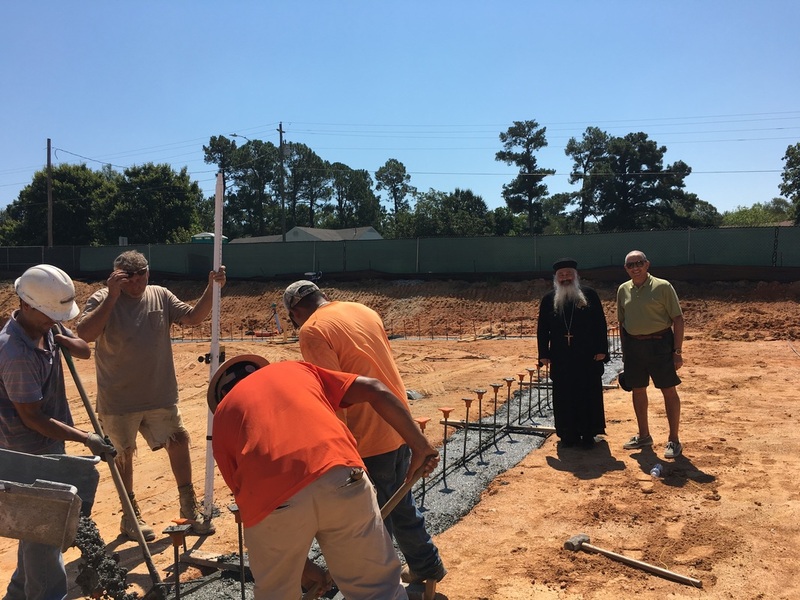 On Saturday 9/16/17, after the liturgy, Church's members gathered to welcome the first truck containing the new benches of the Archangel Michael and Saint Misael the Anchorite Church. 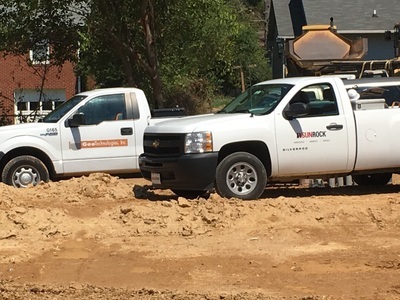 The arrival of the truck happened one year after H.G.B. 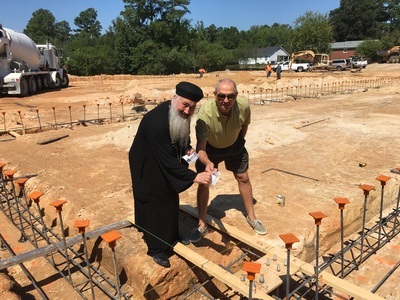 Peter laid down the foundation stone that was on 9/14/2016. 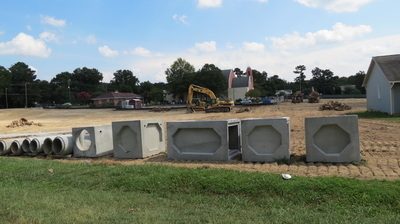 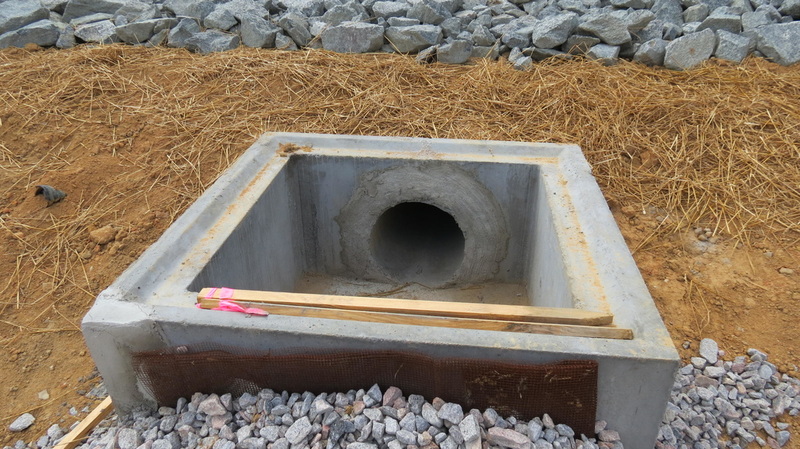 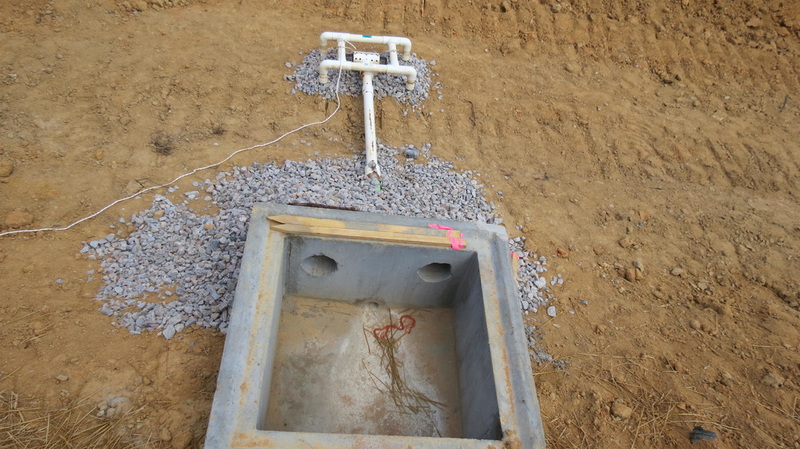 On 2/22/2017, the tunnel concrete segments arrived on site and were lowered in the ground to connect the building with the basement of the current Church. 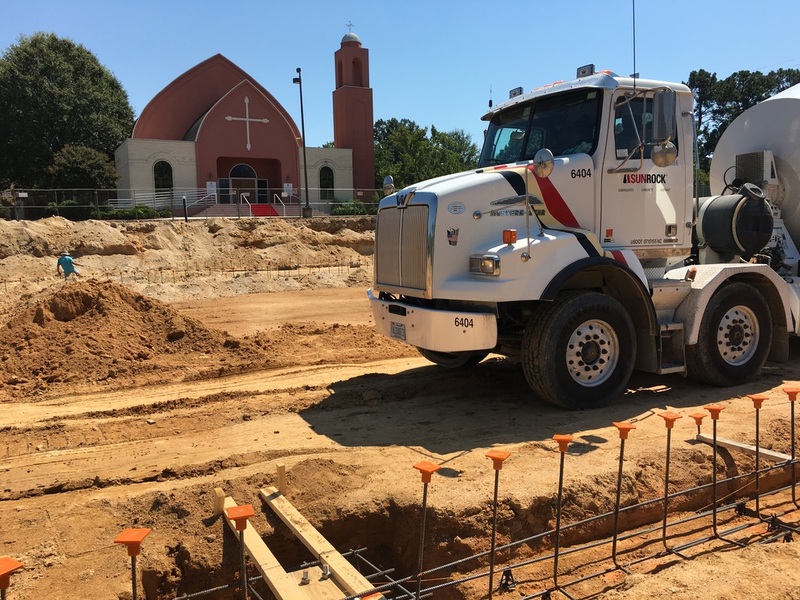 On 2/11/2017, while the building construction is taking place, Accu-Steel Inc started by fencing the main parking lot, the ramp and half of the Church's main entrance stairs to prepare the site for the tunnel's installation. 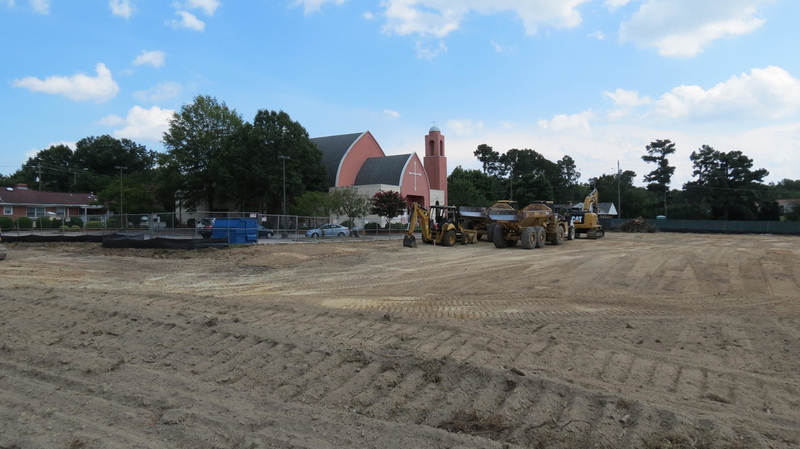 On 10/2/2016, the new parking space, on the North side of the Church, started to take its shape. 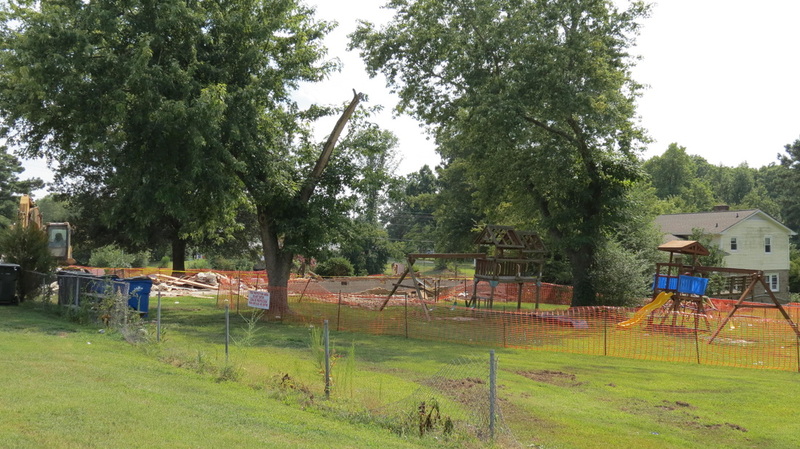 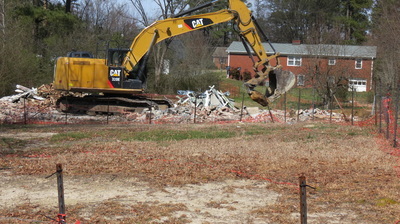 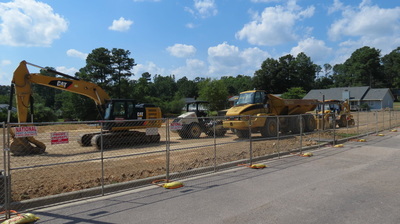 Also, the construction of the new building has started. You can see the steel, the surrounding walls, the black insulation, the elevator space, the ramp, the gutters, the doors and windows of the basketball court. 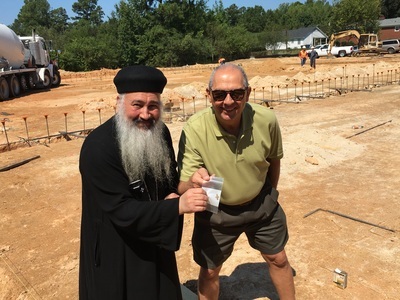 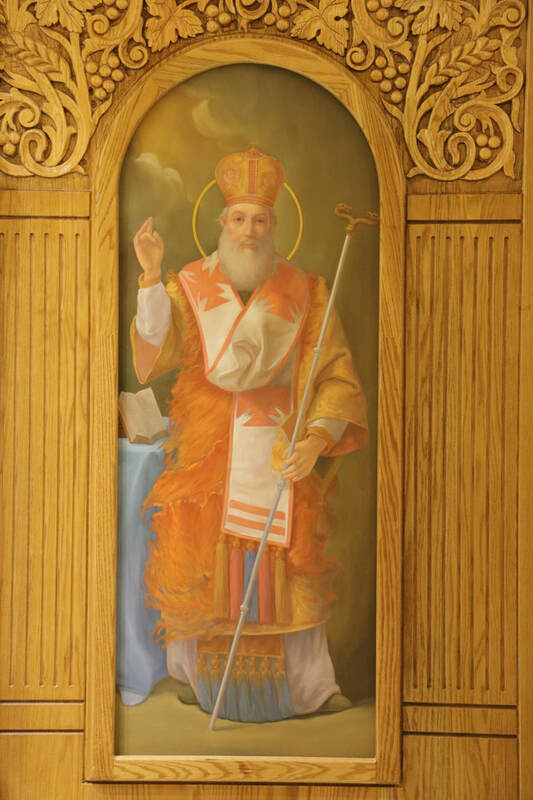 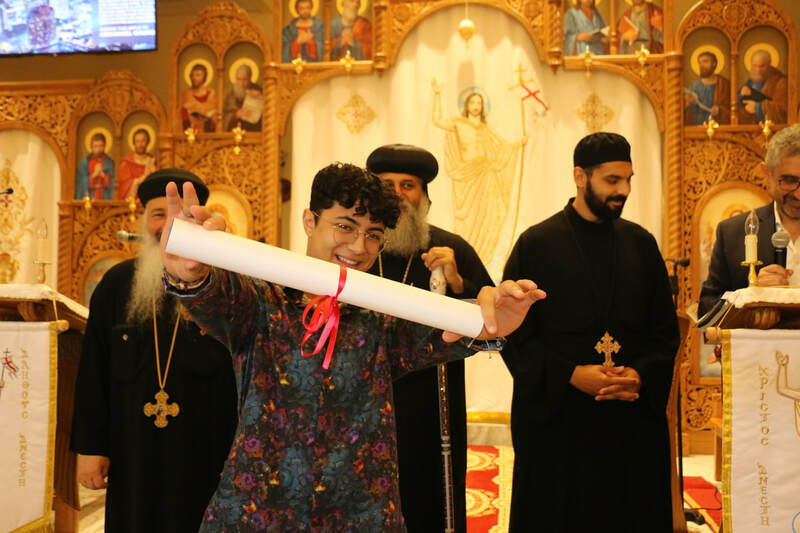 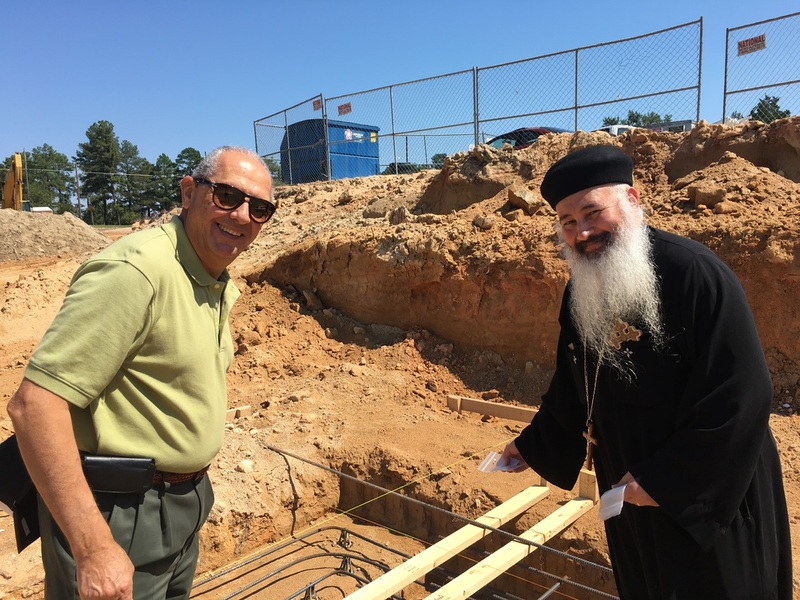 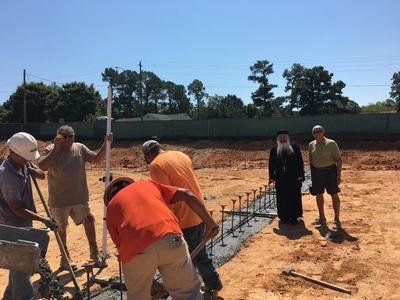 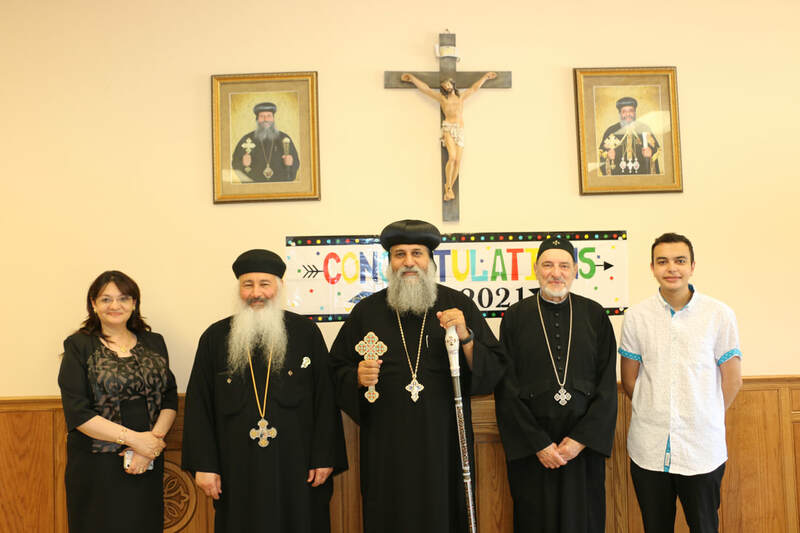 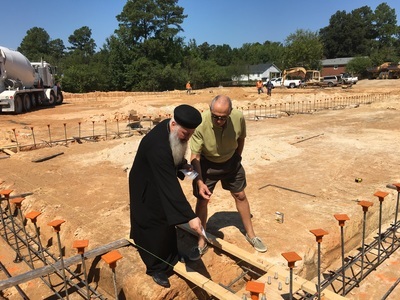 On 9/14/2016, H. G. Bishop Peter laid down the foundation stone of the youth services building and the Church of Archangel Michael and Saint Misael the Anchorite in front of Saint Mary Church. 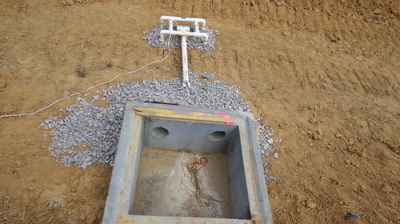 Placed small cross in the four corner's stones. 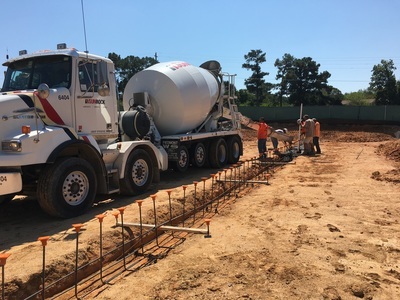 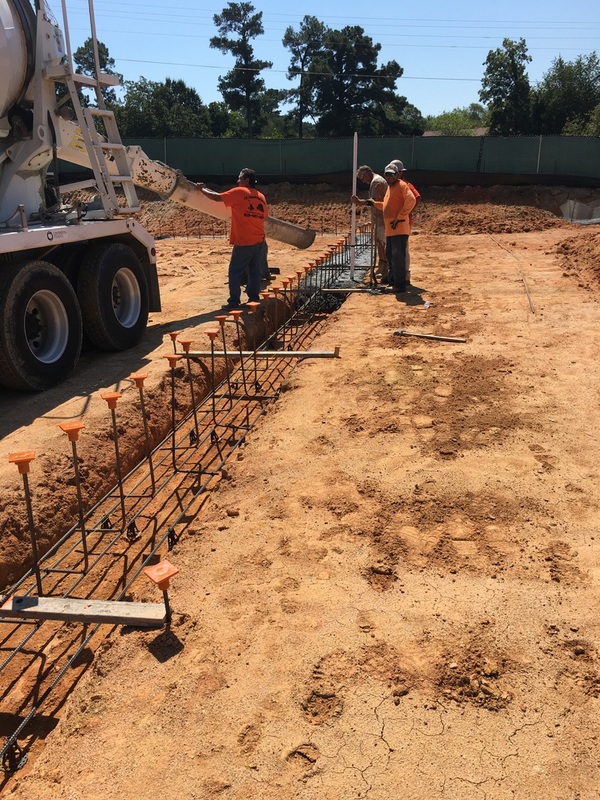 Pouring concrete for the Gym's slab. 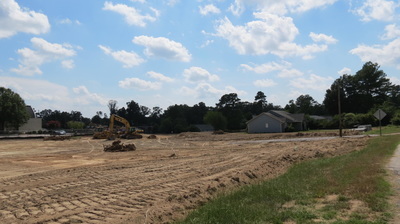 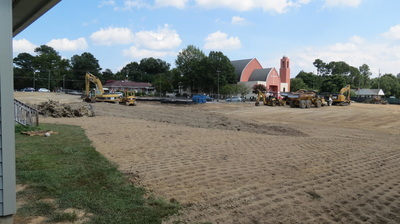 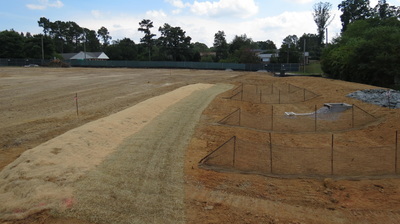 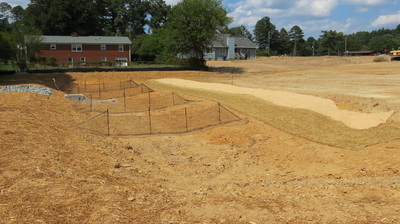 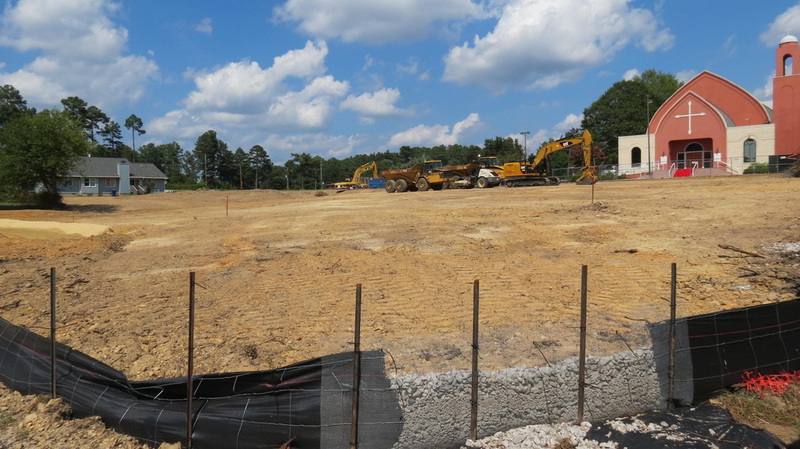 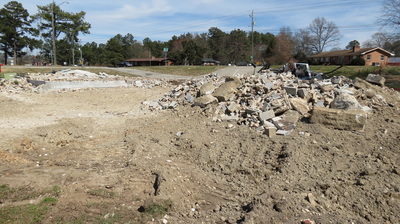 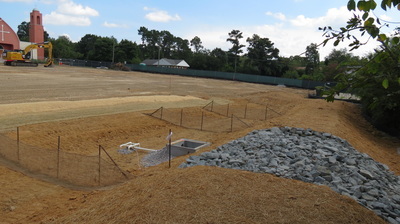 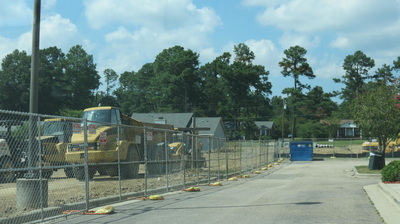 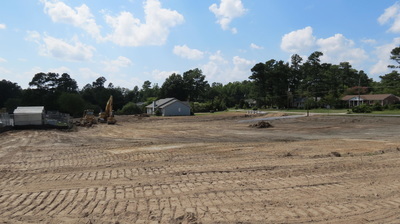 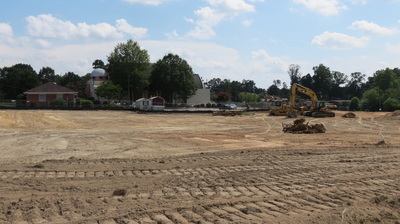 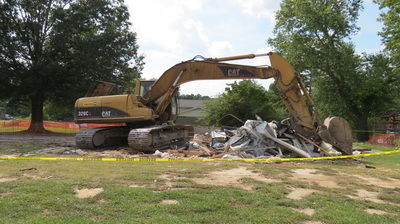 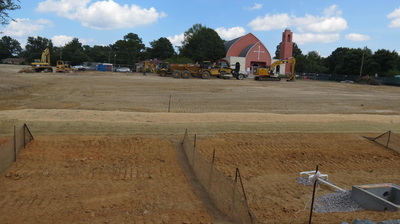 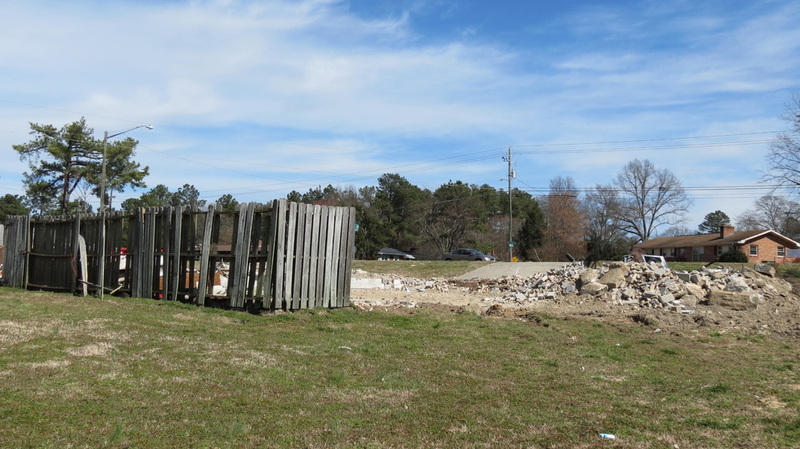 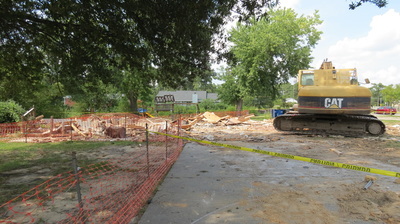 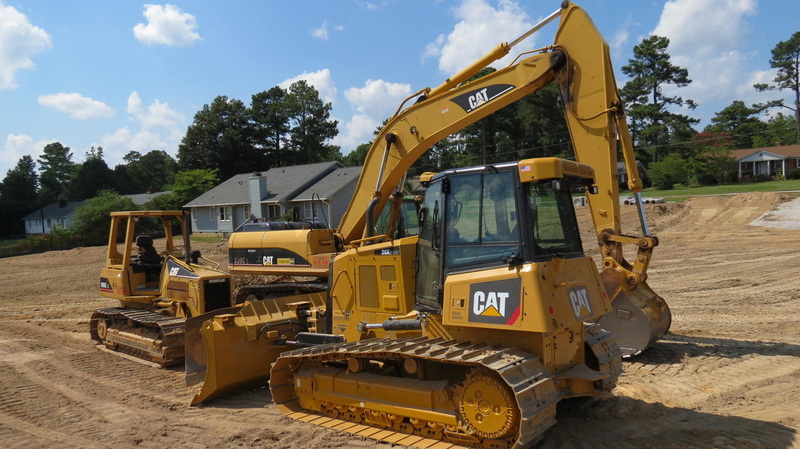 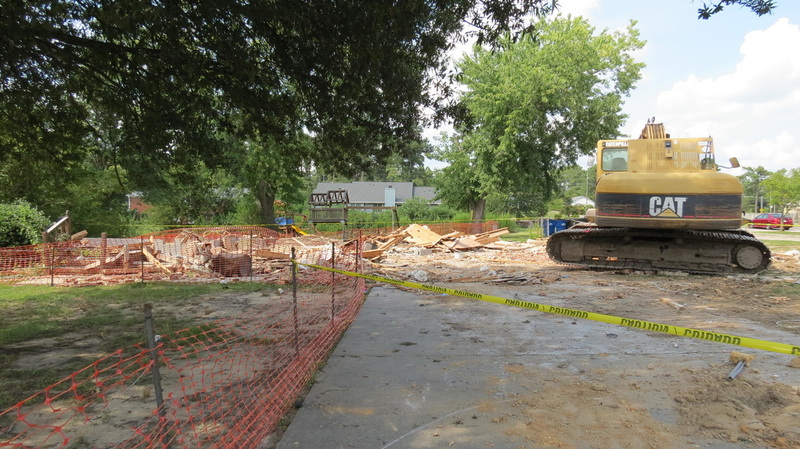 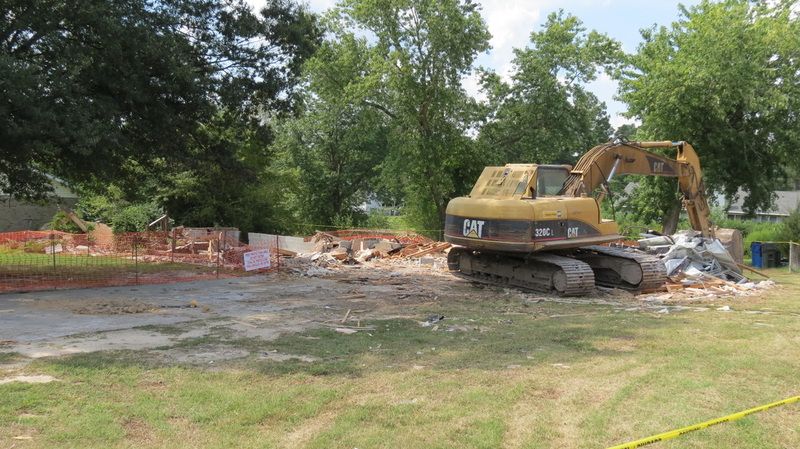 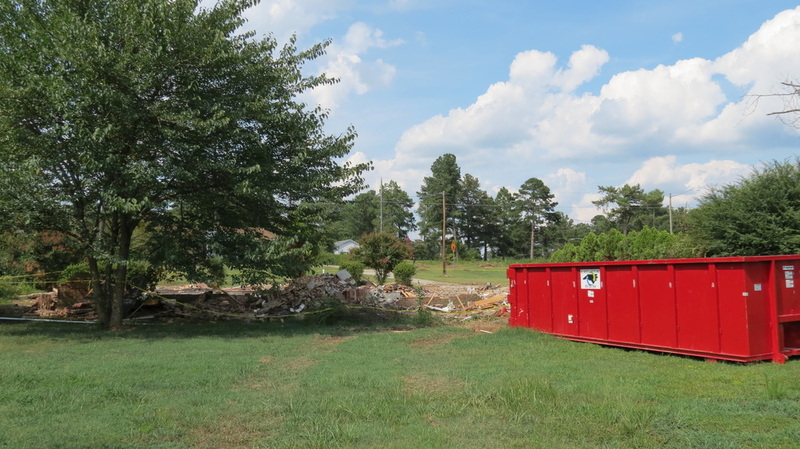 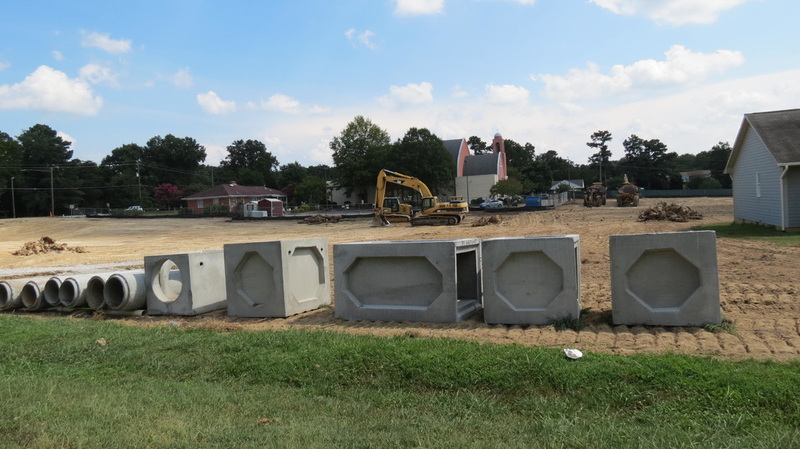 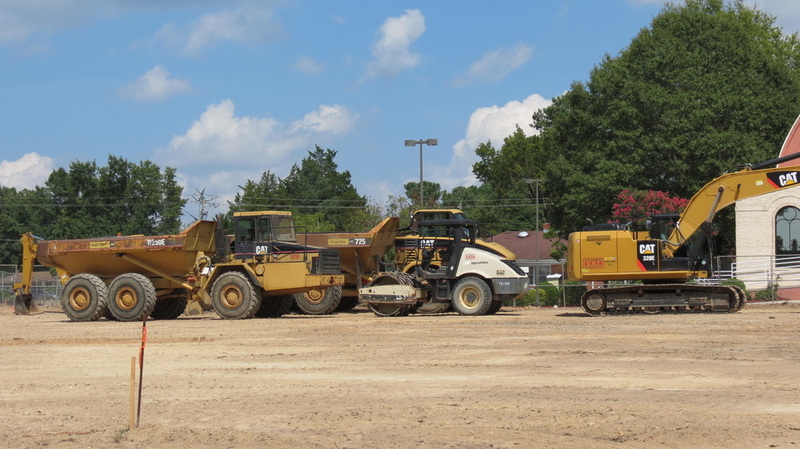 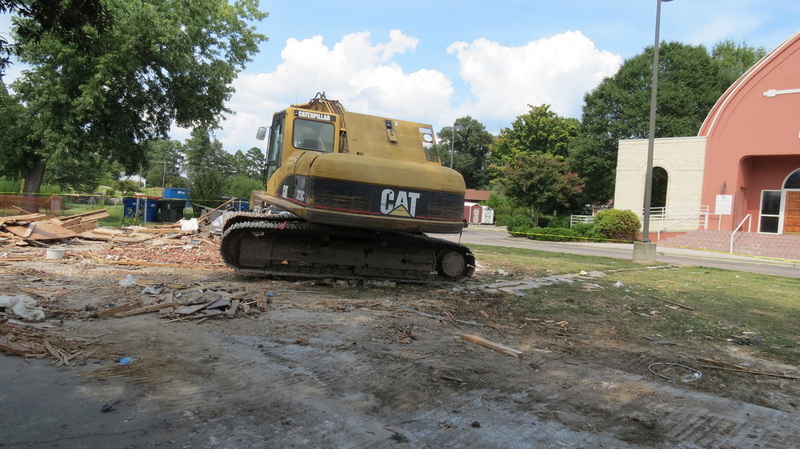 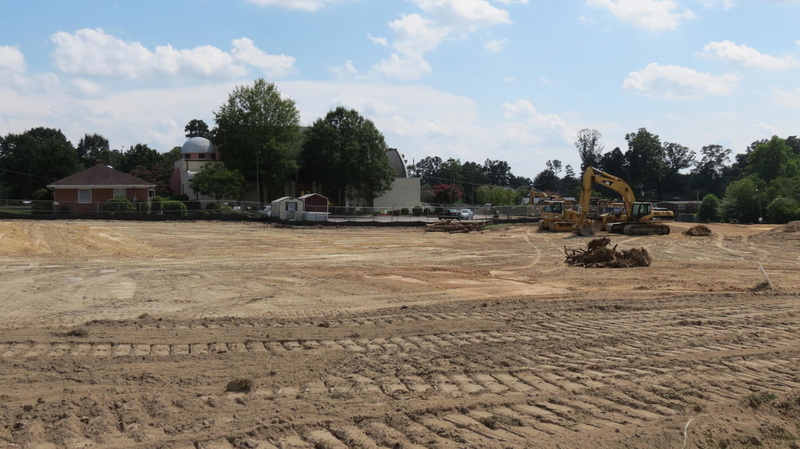 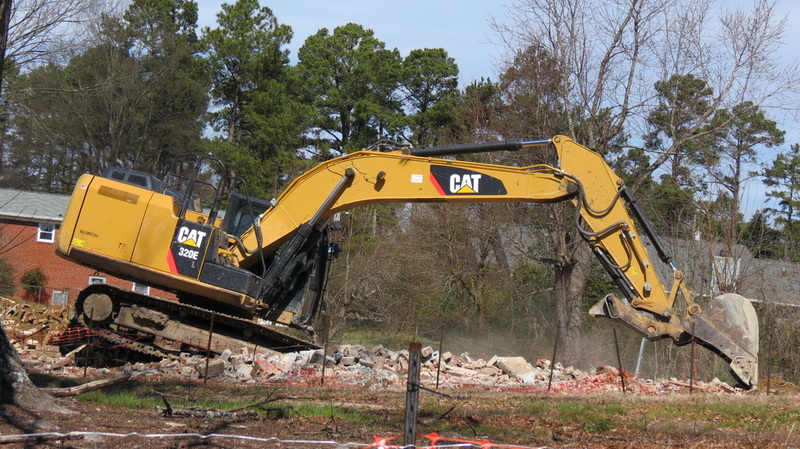 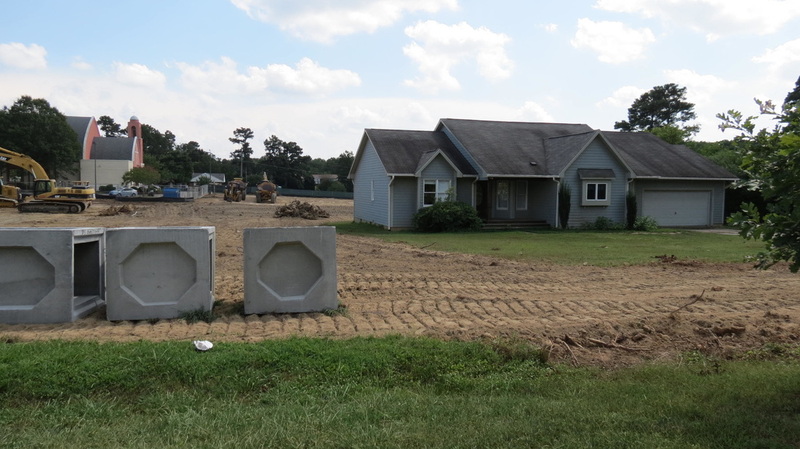 On 8/5/2016, Bulldozers started to level the land preparing the site for the New Hope Road's new parking lot and and the new building. 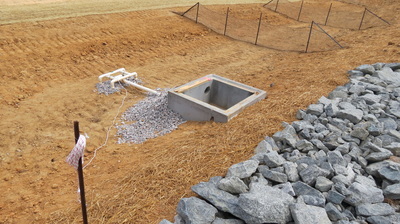 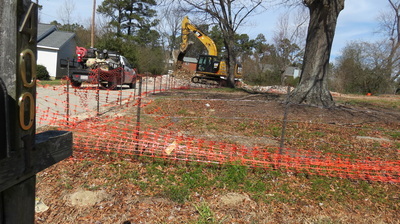 The utility companies started to wire electricity, gas, and cables needed for the new building. 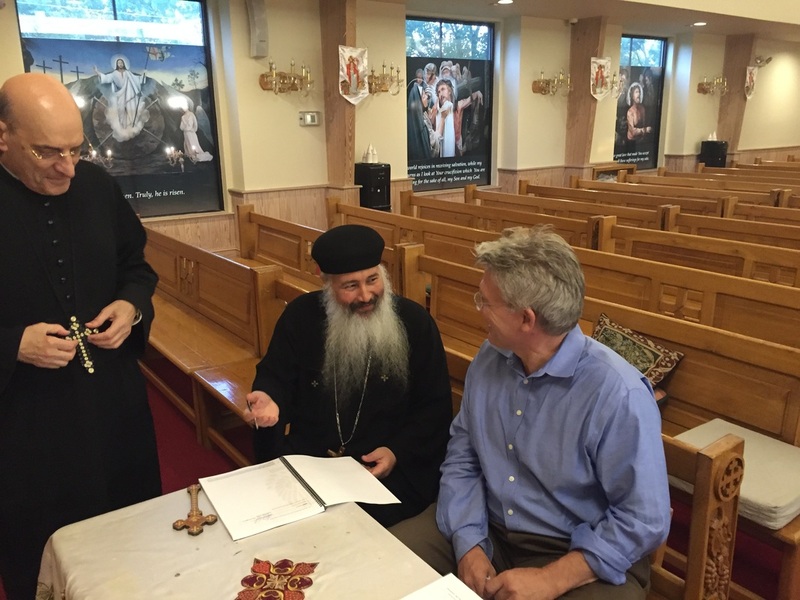 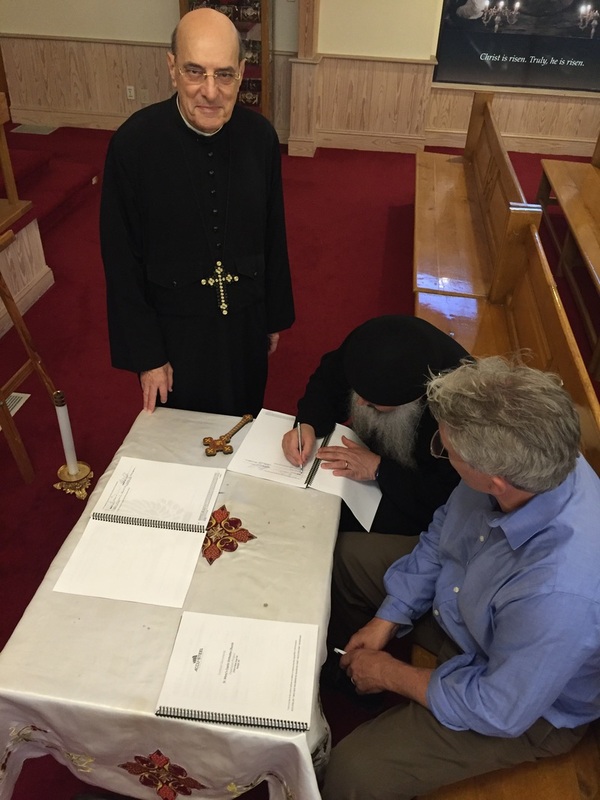 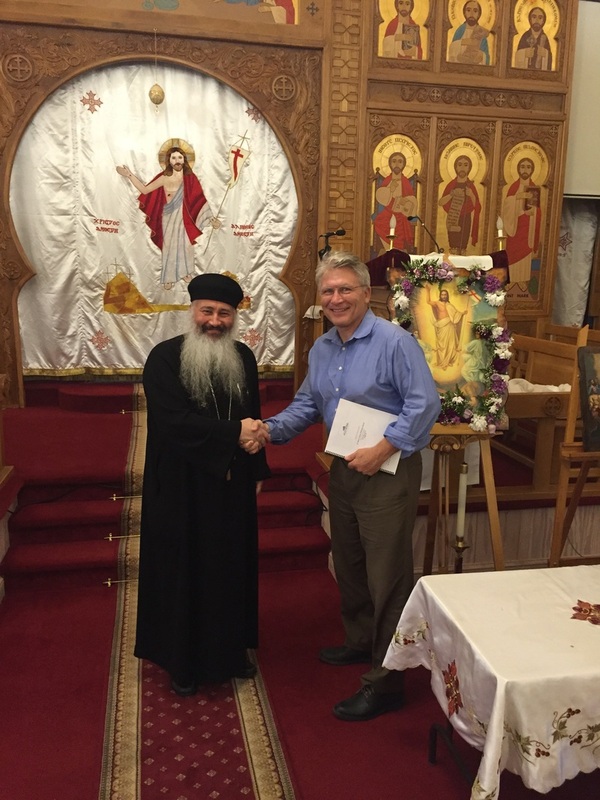 On 6/8/2016, after Wednesday Liturgy, Father Misaeil signed the contract to officially start the new building construction. 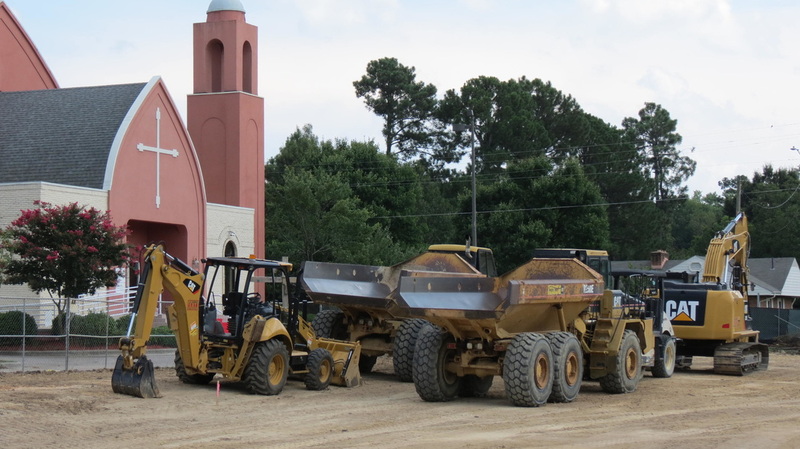 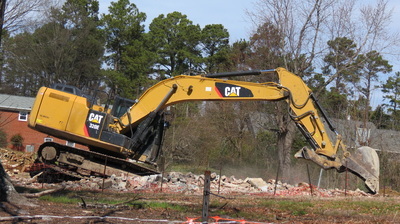 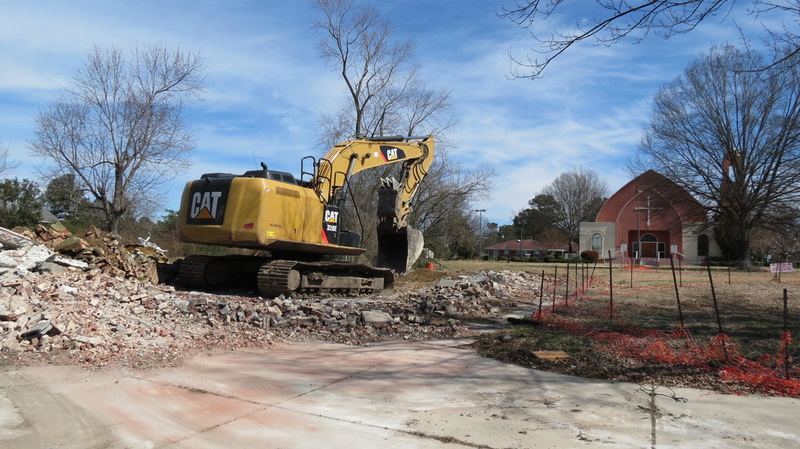 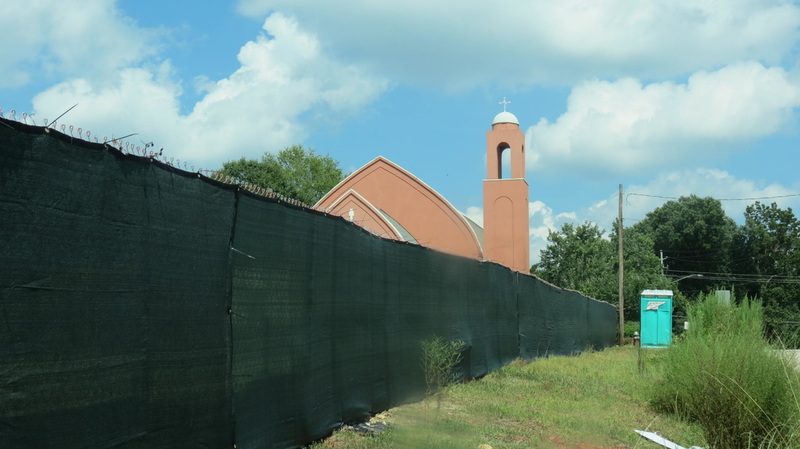 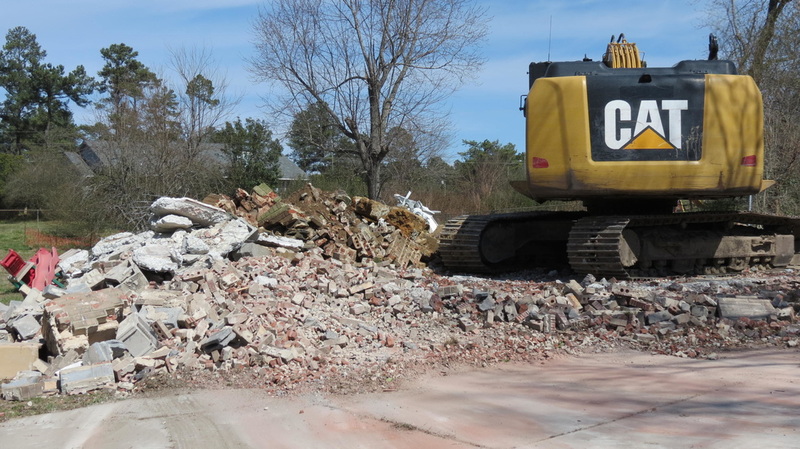 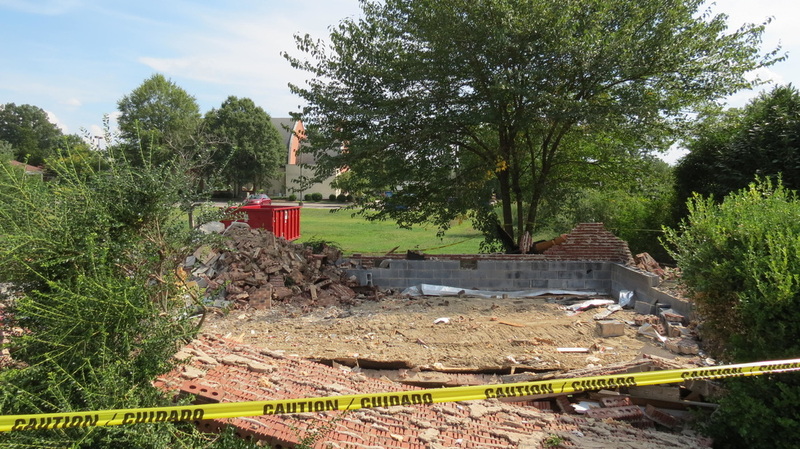 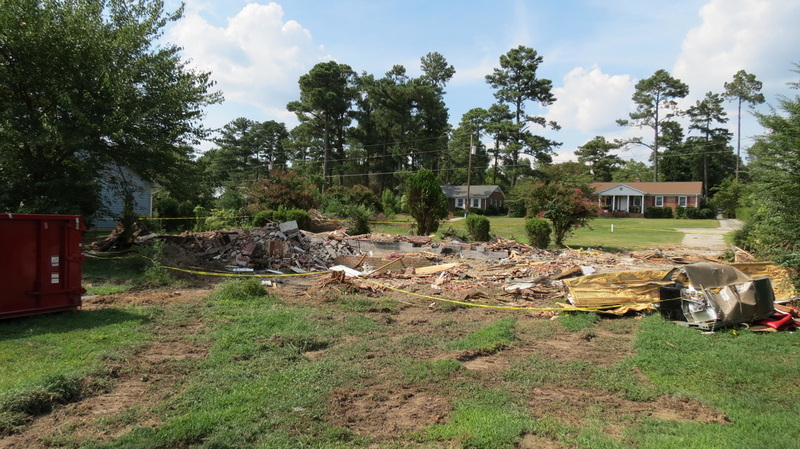 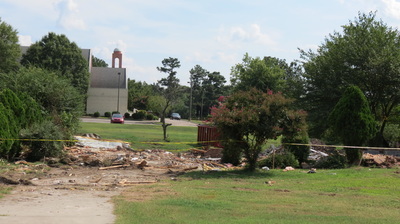 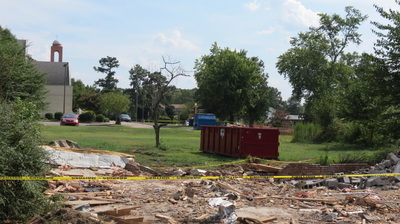 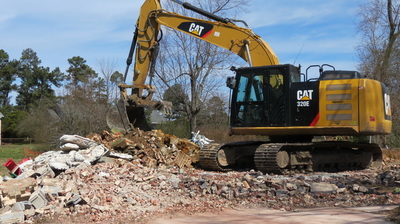 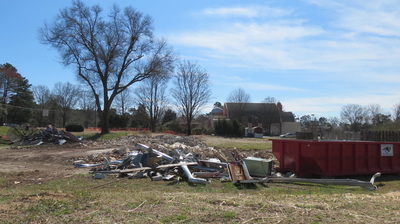 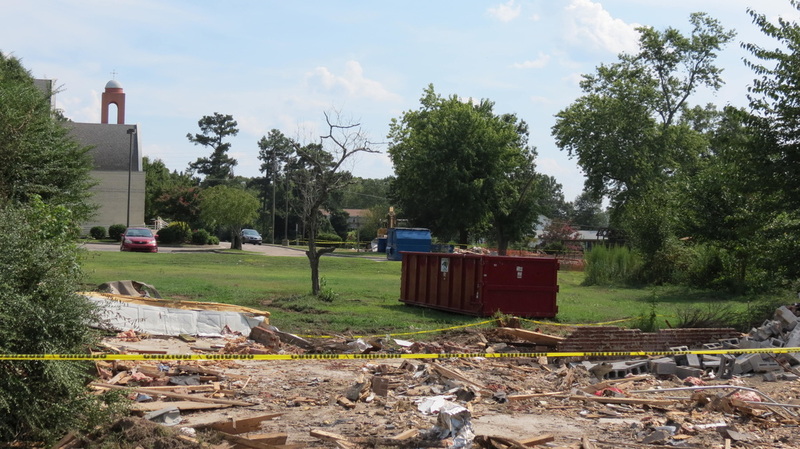 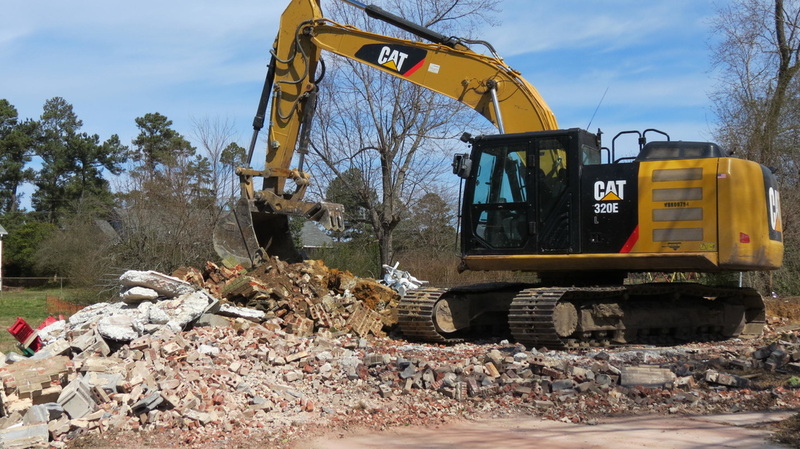 On 8/12/2015, the process started to prepare for the new Church's building by demolishing three houses. 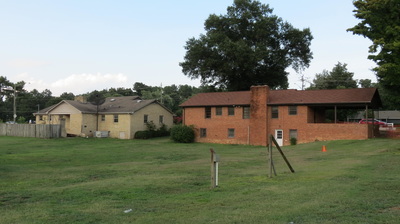 The first one was on the West (Senior's house) and the two others were on the North side of the Church. 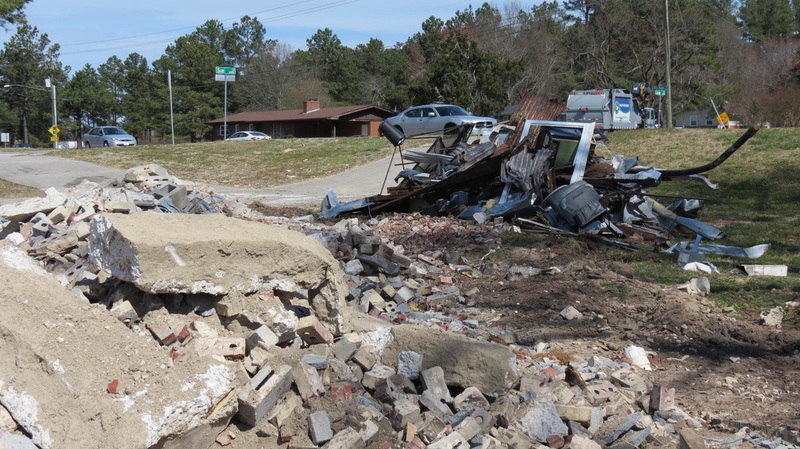 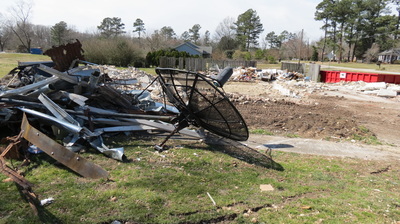 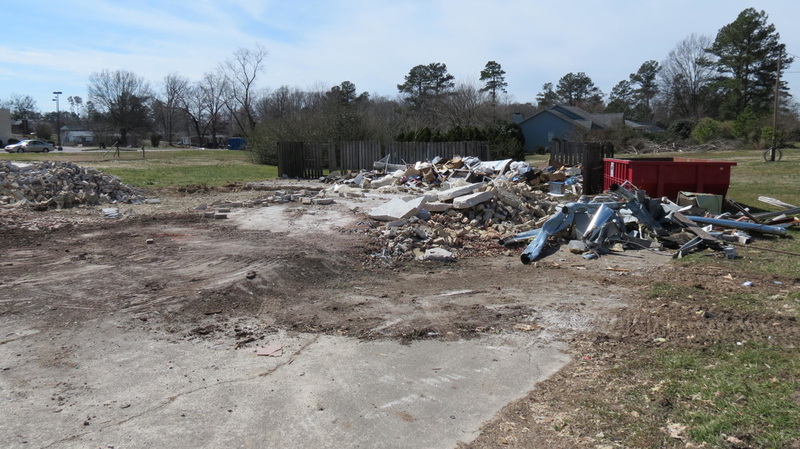 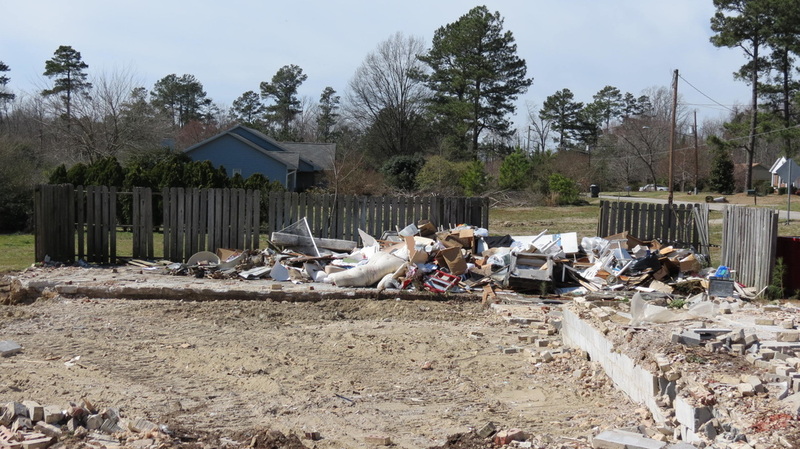 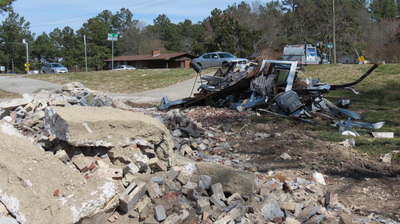 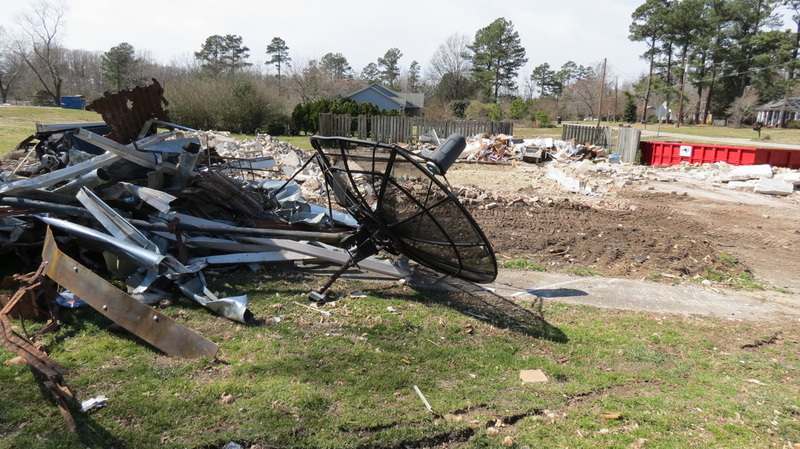 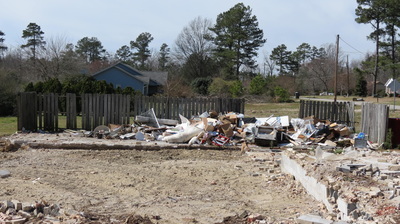 On 3/3/2016, another two houses were demolished, one on the West side and the other was on the North side (Youth's house). 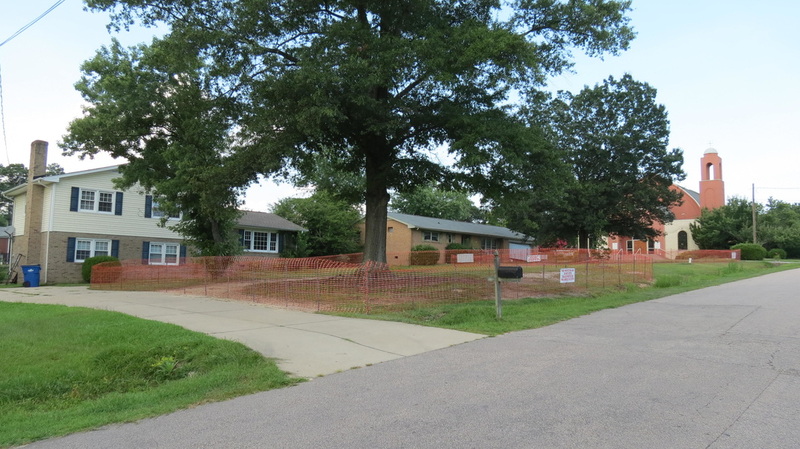 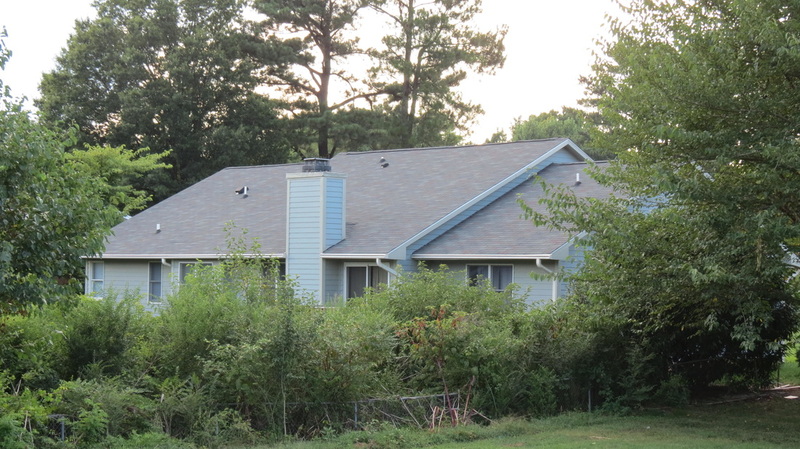 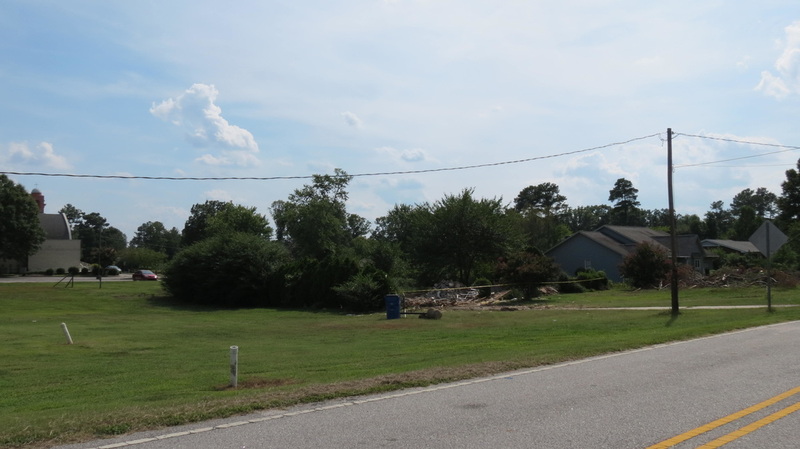 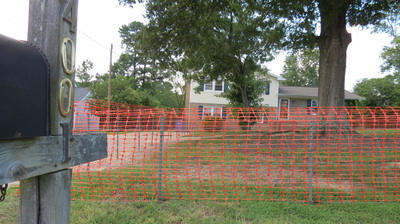 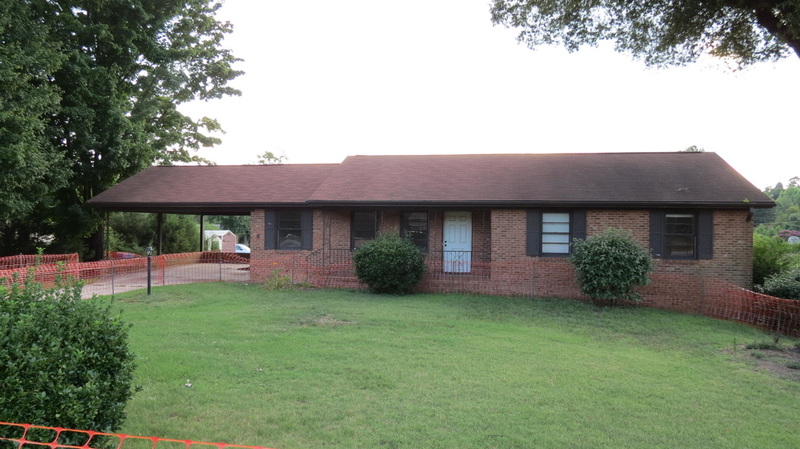 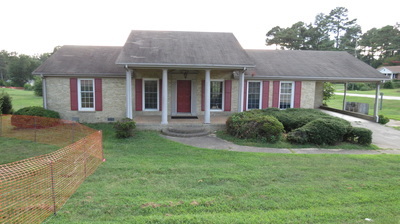 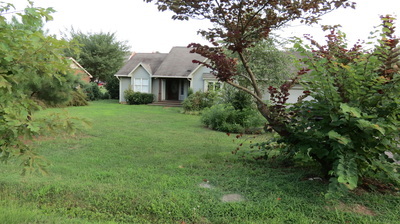 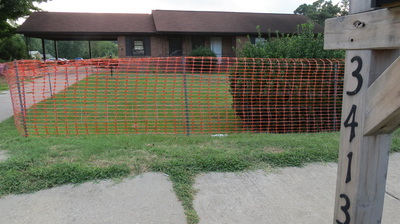 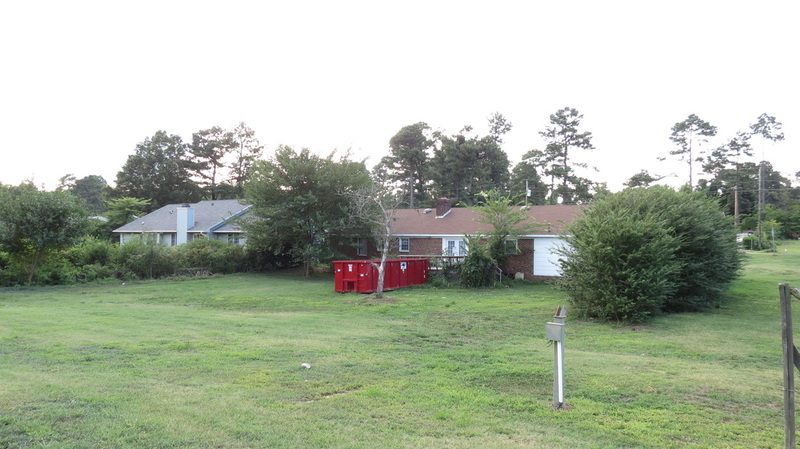 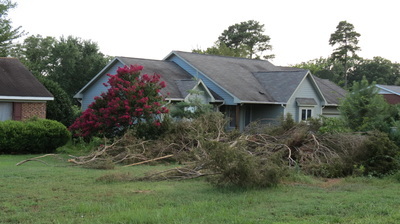 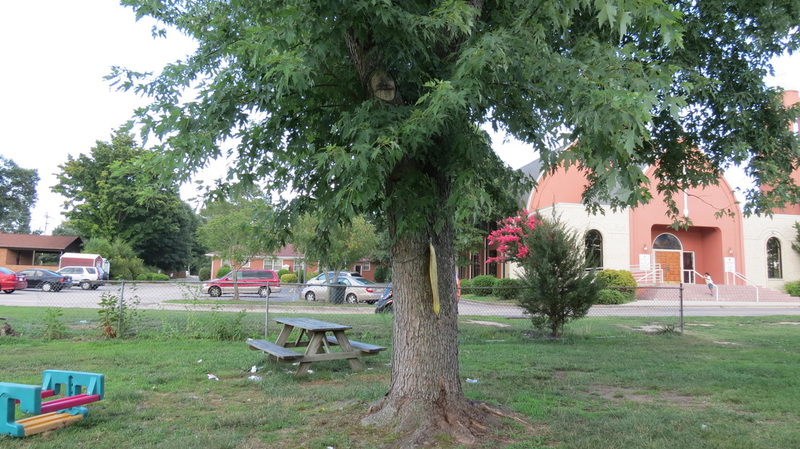 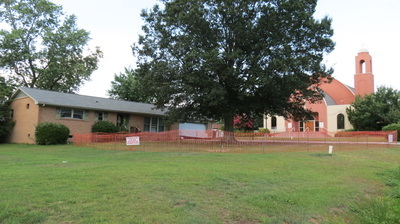 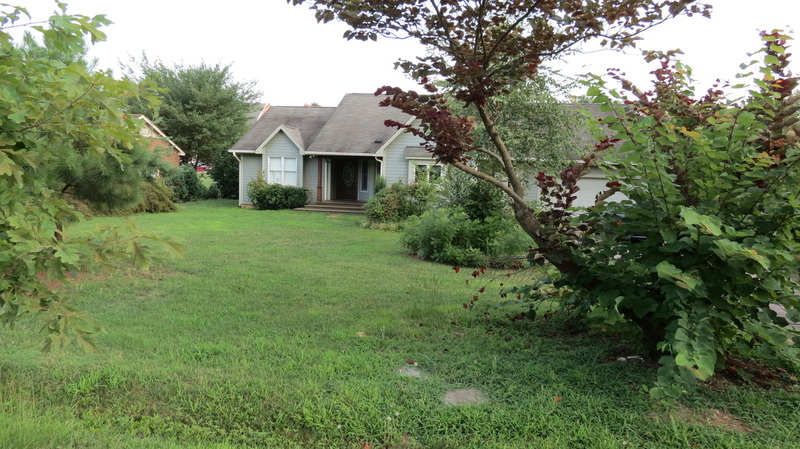 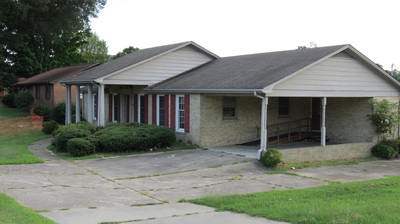 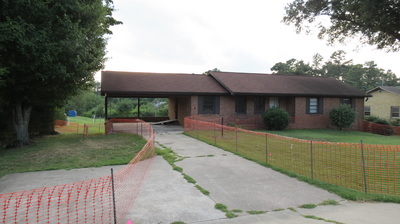 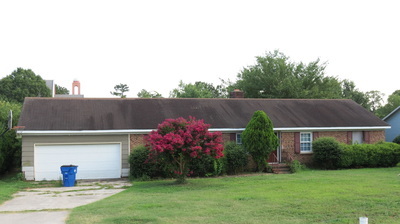 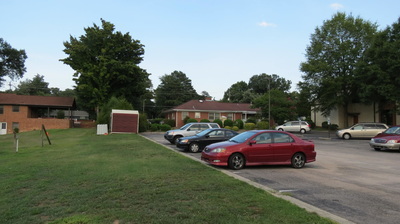 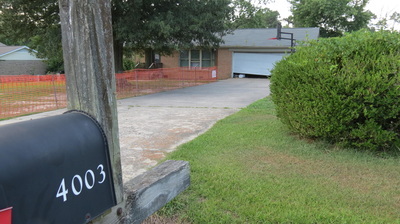 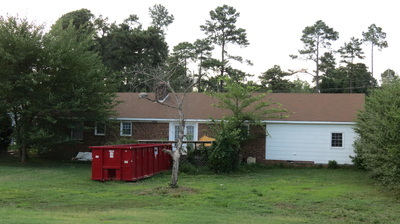 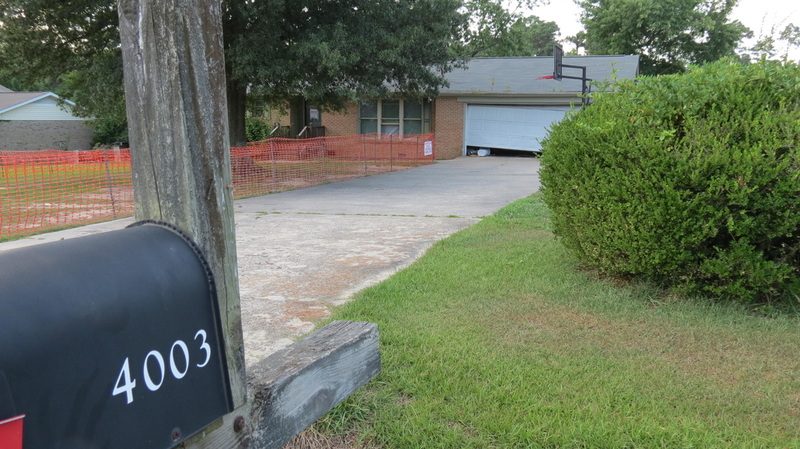 On 7/17/2015, pictures were taken for the seven houses that were around the Church. 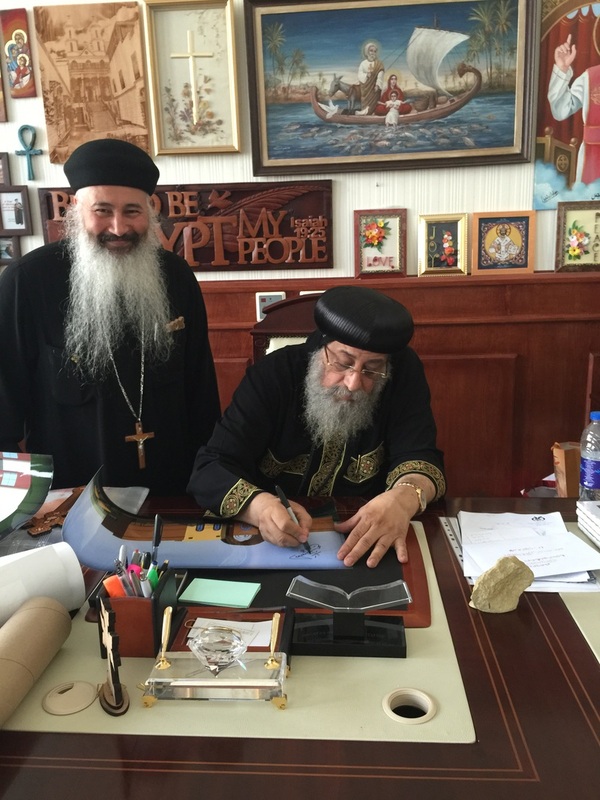 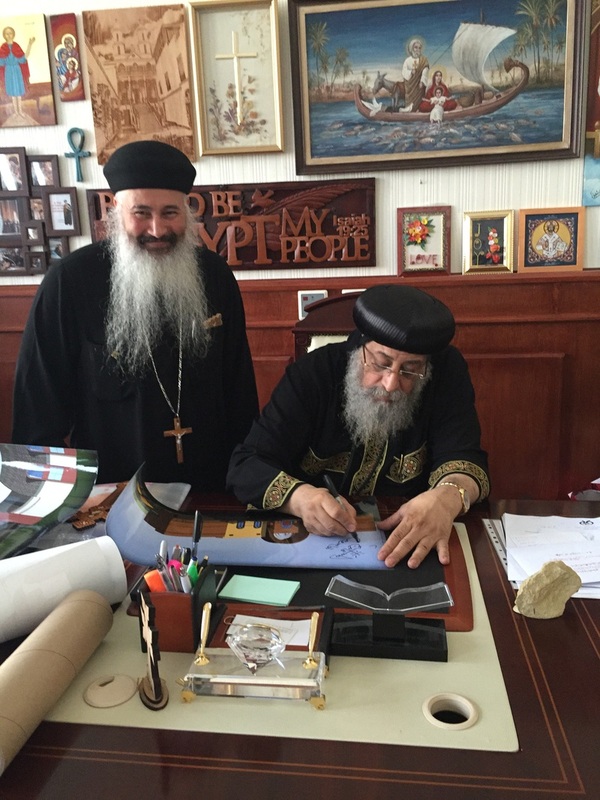 His Holiness Pope Tawadros II blessed the Church's new building idea by signing the sketchup concept pictures.